Sarcasm is such a lost art form on some. It makes me cry. 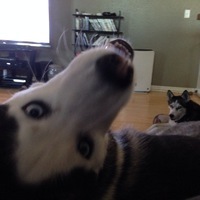 The husky that you see is Sid. He is 2. No, it is not cruel to keep one in FL. Their coat protects them from both hot and cold. Sid is my second husky. I love the breed so much that I recently started fostering them. Life is never boring with them around.